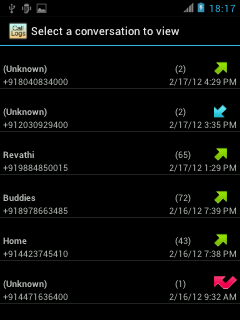 Android OS allows users to backup & restore the contacts. There are lot of android applications in the market to backup & restore the contacts. 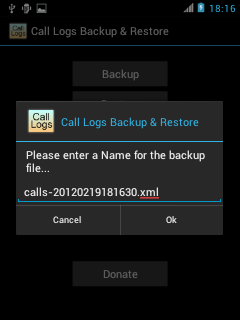 I'm going to explain about Call Logs Backup & Restore android application. It's a very good application to backup and restore the android call logs. Let's say, you want to update your phone software with the latest available version and you would be losing all the user pref data like contacts, call logs, and SMS etc. 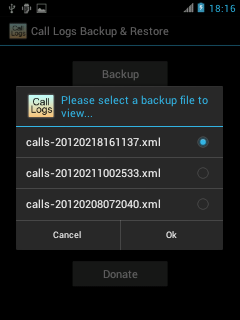 This is a very good application if you're looking to backup the call logs. This will create an XML file on your SD card when you take a backup i.e. ; you can even read the information on the PC directly since it's an XML format. It's a free application over the Google market. However, you can find the apk below which you can directly install on your device. 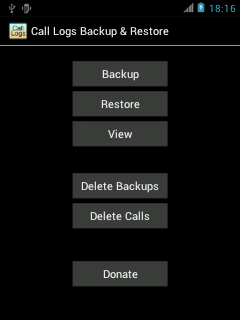 You can find various options like "Backup", "Restore", "View", "Delete Backups", "Delete Calls", and "Donate" buttons on the home screen of this application. Restore: This option is meant for restoring the data that has already been taken as the backup. When you chose this option, user will be prompted with a popup of all the existing backup files which have been taken so far. It will proceed for restoring the data, when user confirms the dialog. Here the screenshot when restoring. 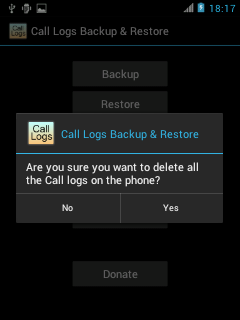 Delete calls: This will let you delete your current call log history on your device. Of course, you can do this on your device if you've that option as few vendor software has this option inbuilt. Donate: Another feature to donate whatever you can to the developer. Thanks for reading this. Please drop a comment if you like this post.